Set photos from filming on Spider-Man: Far From Home in Europe seem to show that Peter Parker will get himself an all-black stealth suit in his upcoming sequel. But that might not be the only wardrobe change the wall-crawler’s got coming. According to MCU Cosmic’s Jeremy Conrad, the follow-up to Spider-Man: Homecoming will also feature a revamp of the familiar souped-up suit Tony Stark made for him in Captain America: Civil War. Conrad states that “a most reliable source” has informed him that Peter’s main suit in Far From Home will be red and black, derived from a concept that was initially developed for Homecoming but ultimately ditched. Is This What Spidey's Red Suit Will Look Like In Spider-Man: Far From Home? As you can see, it’s pretty much the same suit as the one we’re familiar with except that the blue has been swapped for black. Comic book fans may also see a resemblance between this outfit and that worn by the Superior Spider-Man – when Otto Octavius had control of Peter’s body – on the page. 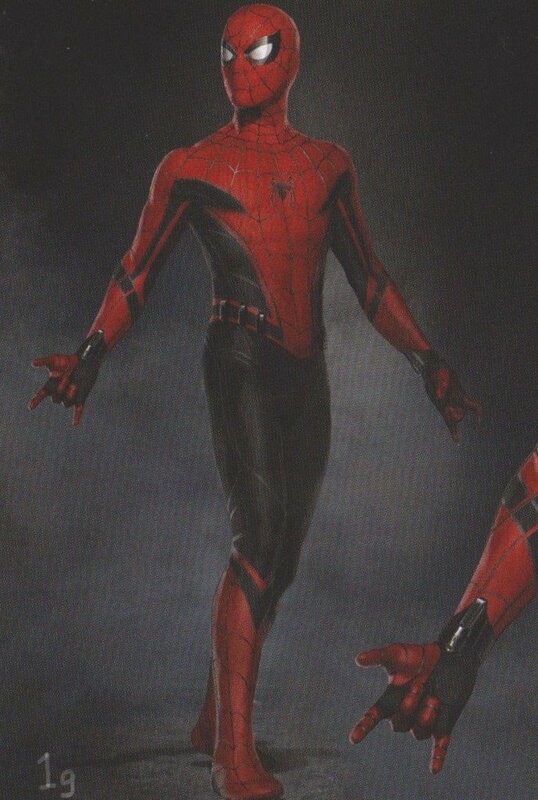 In that case, the black detailing obviously symbolized that this was a darker Spider-Man and along with the colorless stealth suit, it does seem like Marvel’s sending out the message that Tom Holland’s lighter-hearted Spidey might be more mature next time around. He’ll definitely have his work cut out for him, too. While he’s on vacation with his school friends, it seems he’ll get caught up battling another costumed freak in the form of Jake Gyllenhaal’s Mysterio (recently glimpsed in set photos). Though it doesn’t look like Iron Man will be lending a hand on this occasion, at least Nick Fury and Maria Hill will be on the scene to some degree (Samuel L. Jackson and Cobie Smulders have also be seen on set). We’ll let you know if more info on this potential costume change comes to light, but in the meantime, tell us, would you like to see the red and black suit in Spider-Man: Far From Home? Have your say in the comments section down below.